From San Juan it is about 1,200 miles back up to Bermuda, closing off the triangle. You might think that the barren waters of the Triangle are just boring sea, vast, tempestuous, and seldom viewed by man, being a deep blue with white caps and foam. Quite the contrary! The heart of the Bermuda Triangle is covered by the strangest and most notorious sea on the planet— the Sargasso Sea; so named because there is a kind of seaweed which lazily floats over its entire expanse called sargassum. Catching sight of these huge mats of seaweed have always marked the perimeter of this peculiar sea. Columbus himself made note of it. Thinking land was nearby, he fathomed the sea, only to find no bottom. The bottom is, in fact, miles below on the Nares Abyssal Plain. The Sargasso Sea occupies that part of the Atlantic between 20º to 35º North Latitude and 30º to 70º West Longitude. It is in complete contrast to the ocean around it. Its currents are largely immobile yet surrounded by some of the strongest currents in the world: The Florida, Gulf Stream, Canary, North Equatorial, Antilles, and Caribbean currents. These interlock to separate this sea from the rest of the tempestuous Atlantic, making its indigenous currents largely entropious. Therefore anything that drifts onto any of its surrounding currents eventually ends up in the Sargasso Sea amidst its expansive weed mats of sargassum. Because of the entropious currents, it is unlikely anything would ever drift out. 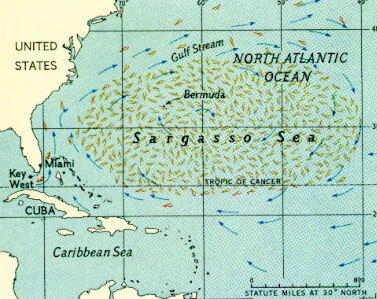 The Sargasso Sea rotates slightly itself and even changes position as its surrounding currents change with weather and temperature patterns during different seasons. Scientists have discarded their first thought that the strong Gulf Stream carried and deposited shoreline seaweed into this large sea. Recent investigations have concluded that the sargassum is actually adapted and has reproduced to become native to the area, a strange forest of seaweed growing hundreds of miles from any land. Legends of a “sea of lost ships” predates the Bermuda Triangle by centuries and was, in many ways, strikingly similar to the mythos of the modern Bermuda Triangle. Derelict vessels were found here more often, shipshape but deserted. On one occasion a slaver was sighted with nothing but skeletons aboard. The Rosalie sailed through this area in 1840 before later turning up derelict, as reported in the London Times. In 1881 the schooner Ellen Austin supposedly found a derelict schooner and, placing a prize crew aboard, sailed in tandem for port. Two days later the schooner was sighted sailing erratically. When boarded again, the ship was once again deserted. There was no trace of the prize crew. The bark James B. Chester was found deserted in the Sargasso Sea in 1857, with chairs kicked over and a stale meal on the mess table. Modern derelicts have included the Connemara IV, found drifting 140 miles from Bermuda in 1955, plus a number of yachts and sailboats found in 1969 and 1982. The Sargasso Sea, like the Bermuda Triangle, received popular and often tabloid press. Paintings showed sailing vessels being devoured by the sargassum, and, at the turn of the century, readers were led to believe that freighters sat becalmed and weed shrouded with old sailing ships— even Roman triremes, for nothing ever changed in this stagnant sea. Most older maps delineate the location of the Sargasso Sea with seaweed. An evaluation of ship and aircraft disappearances draws a striking connection with this ancient sea of mystery and the modern Bermuda Triangle: the northern boundary of the Sargasso Sea more correctly represents the northern limits of the area of disappearances, for many aircraft and ships were in this vicinity when they vanished– i.e. a few hundred miles north of Bermuda but just entering the Sargasso Sea. The s.s. Poet, 520-feet, bound for Gibraltar in 1980, a SAC B-52 on maneuvers in 1961, KB-50 ariel tanker in 1962, a Super Connie in 1954, a Navy Martin Marlin amphibian in 1956 are but a few examples. The “Seaweed Sea” has a centuries old rep. for mysterious disappearances. Note also how the map implies the seaweed is coming out of the Gulf with the Gulf Stream currents, a passé theory: the sargassum is actually now believed to be adapted and native to this strange sea, with very little of its cousins actually coasting in from the surrounding currents. Some of the above, though exaggerated, was based on fact. For centuries the Sargasso Sea was dreaded by the seafaring because of its deadly calms. Many times the Spanish found themselves becalmed for weeks, being then forced to jettison their war horses in order to conserve water. Hence the area known as the “Horse Latitudes” traverse the Sargasso Sea. Another name would be the “Doldrums.” The sargassum could even contribute to stalling a vessel during these long periods of weak winds. And today props on smaller boats can be fouled by the weed mats, causing them go dead in the middle of nowhere. These monotonous calms are no doubt thanks to the surrounding Gulf Stream currents which isolate the Sargasso Sea from the surrounding hostile and cold waters of the North Atlantic. The Sargasso Sea remains a warm sea by contrast, with high evaporation and low precipitation favorable to a more steady climate and hence weaker winds. The “Sea of Lost Ships” has not been solved in modern times; it has only expanded to the skies above. And the mystery of missing aircraft seem even greater since neither calms nor sargassum can effect them. Nor can it affect the large freighters that can easily plow through the sargassum and steam through calms with little effort. Regardless, a number of large cargo vessels are completely unaccounted for after entering this sea. When adding the reputation of the Sargasso Sea to that of the modern Bermuda Triangle, the enigma of this sea excites one with its tenacious and centuries old grasp on mystery. If the sargassum and the stagnant calms cannot effect modern travel and yet aircraft and ships disappear alike —and for the same reason— then the mystery is not one of the sea but of the planet itself, its shape, mass and the area’s juxtaposition on this very mysterious sphere we live on. The Sargasso Sea must remain an enigma of this globe, for the forces that have created it have created a masterpiece of visible nonconformity, which may only be the tip of the iceberg for invisible disharmony in its elements. Currents alone cannot explain it. There are many seas in our great oceans which are interlocked by currents. Indeed, all currents are circuitous. There are the South Pacific and Mentor Currents that circle around and hold in the South Pacific, or there are the Brazil and Benguela Currents in the South Atlantic. Though they are thoroughly charted and frequently traveled besides, neither are particularly mysterious nor have they indigenous growth so thick and unaccounted for. The Sargasso Sea calls to mind the greater mystery of shape and mass of our planet, with the resultant anomalies of wind and sea. Perhaps the missing in the Bermuda Triangle provide the same clue about the invisible force fields of our planet, for they are a disconformity with what we consider to be the laws of probability. It seems more than coincidental that the one place on earth where nature remains a mystery should also be a place where travel remains an equal mystery. The conundrum of missing ships and planes may be no greater than the very conundrum of the place in which they so utterly vanish.